« What do Hillary Clinton and Muammar Gadhafi Have in Common? 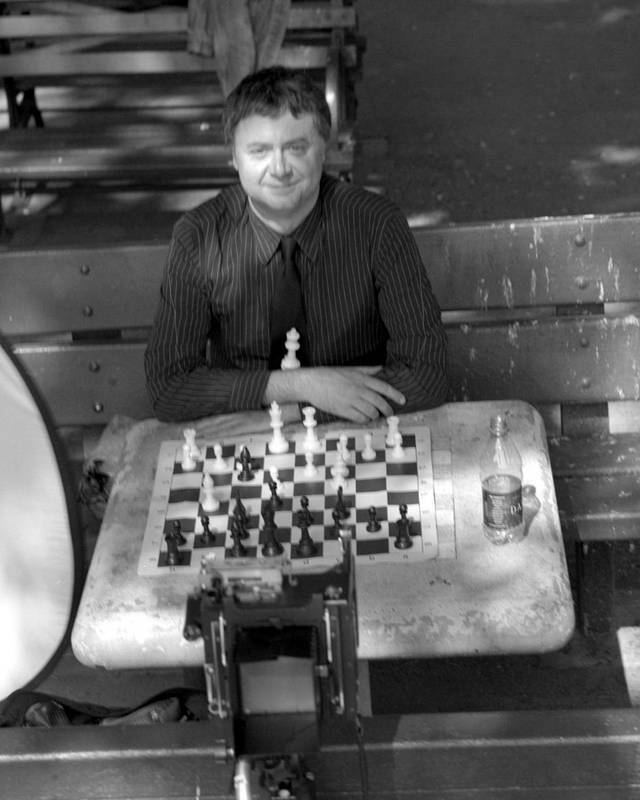 I needed some recent photographs of me that my publisher could use to promote King’s Gambit: A Son, a Father, and the World’s Most Dangerous Game My friend Damian Panitz shot me at a stone chess table in a park in Sunnyside, Queens. Please note all the bird feces (to the right of me on the bench) that Damian subjected me to. There were excrement-free chess tables, but no, Damian is an artist, and he insisted that the light was diffuse, and hence perfect, at this table. Easy for the photographer to say: He did not have to sit under a tree inhabited by a flock of diarrhetic pigeons. There was soupy poop next to the board, and we needed to work fast before goopy dung landed on my black shirt. It was a hot day, and you can see by the water bottle on the table that at least Damian attended to his model’s hydration needs. The Dominican chess hustlers in the park decided I was an Eastern European chess god. They surrounded us, and I tried to tell them that I was just an obsessed woodpusher, but the language barrier interfered with their understanding me. We drafted the guy who said he was champion of the park (and who carried a broken iPod) to hold Damian’s reflector for the photo shoot. The position on the board is something the guy insisted on showing me. For the actual photos (this one was just a test), we set up the age-old position known as the King’s Gambit. This entry was posted on June 21, 2007 at 7:08 pm and is filed under art, chess, drink, words. You can follow any responses to this entry through the RSS 2.0 feed. You can leave a response, or trackback from your own site.